Finding Food in Our Yard! An acquaintance visited our house last week. He came to talk about preservation of a property that my husband and I are working to protect. 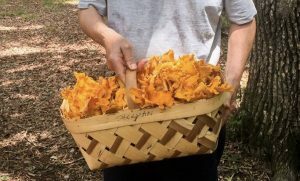 As he came down our long, wooded driveway, he said, “You have thousands of chanterelles in your yard!” He then showed us how to pick them and suggested what to do with them. This year the abundance of rain has created a great opportunity for these rare and delicious mushrooms. Of course, we must be careful to pick real chanterelles. After the lesson, I went to Google and learned of chanterelle look-alike which can cause major stomach upsets. Gratefully these lookalikes didn’t really look like our chanterelles and we felt safe. That night I found a wonderful teaching video on YouTube that described how to prepare these mushrooms–which, by the way, are rich in protein, Vitamin D and many other important nutrients. That video taught me how to cook them with olive oil, butter, thyme, garlic and lemon. Yummy! Because we couldn’t eat all the chanterelles growing in such abundance, we shared them with our friends. Indeed, it’s amazing what you can find in our own backyard. Here’s the recipe video just in case you find these beauties in your own yard.